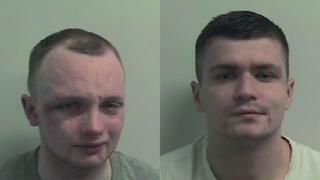 Two men who kidnapped and tortured a teenage boy in Renfrew have been jailed. Christopher Rennie and Anthony Wright pounced on the 14-year-old outside a shop in the town January. The schoolboy was bundled into a flat, blindfolded, battered and robbed. His attackers were convicted of abduction, assault and robbery at the High Court in Glasgow. Wright was jailed for seven years and Rennie for six years and nine months. The court heard the victim eventually managed to escape, despite being forced to walk in women's boots. The pair were found guilty last month when it emerged Rennie, 27, had only been freed from prison a week earlier. At the time, he was less then halfway through a 40-month jail term for carjacking a woman at a supermarket. Judge Graeme Buchanan told the men: "You subjected your victim - a 14 year-old boy - to a terrifying ordeal. "Both of you have bad records, particularly for violence." He said the pair were deemed "high risk" of causing further harm. Addressing Wright, the judge added: "You were subject to eight bail orders at the time. "It is remarkable such a situation was allowed to occur." Rennie must serve 604 days from his previous sentence, before his latest term begins. Both he and Wright will be supervised for a further two years on their release. The court previously heard how the teenager was confronted by Rennie and Wright as he left a shop in the town's Hairst Street about 18:15 on 27 January. The victim was shoved into a nearby close and thrown into a flat where Wright had been staying. Prosecutors described what then happened as a "fast-moving and frightening incident". He was punched before being struck across the legs with a weapon. The teenager was then blindfolded and shoved into a bath where he was hit across the face with a baseball bat. He escaped when Rennie and Wright ordered him to go home and steal £500 from his mother. Det Chief Insp Fil Capaldi said: "These two despicable individuals preyed on an innocent teenage boy who was simply making his way home from the shop. "They blindfolded, assaulted and terrorised him, subjecting him to a sickening and degrading assault and made him genuinely fear for his life. "This crime truly shocked members of the public who were left absolutely disgusted at what these individuals did. "They are clearly a danger to society and have no place in our community."